Home › Articles › Online Articles › Conus gubernator leehmani in the Seychelles ? The Seychelles, one of the last paradise on earth, host many of the Indian Ocean Sea Shells species. Some particularities occurs there though. The islands host the beautiful pinkish Cypraea hirundo francisca, Schilder. & Schilder 1938 and Conus textile is not present. 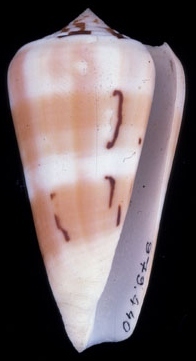 This archipelago owns Conus gubernator, Hwass 1792 Cone shell specie. 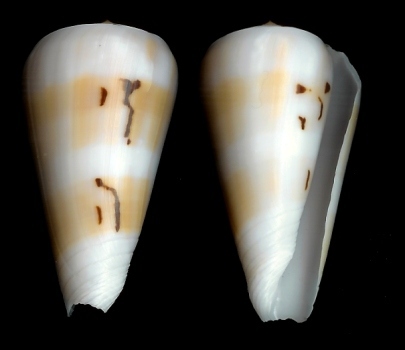 Two publications : The Cone Shells Os Seychelles, A.G. Jarrett & D. Slimming (G.T. Phillips & Co Ltd., 1970); Marine Shells Of The Seychelles, A.G. Jarrett (Carole Green Publishing,2000) can be found concerning local Cone Shell species. The most recent one shows three specimens of Conus gubernator, Hwass 1792. 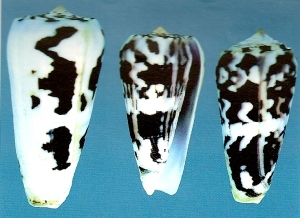 None of these 3 shells really look like Conus gubernator form leehmani, da Motta & Röckel 1979. The Seychelles are included in form leehmani distribution area though. I have the chance to have collected two specimens of Conus gubernator there recently. They look pretty different from the usual Conus gubernator and especially from the one shown in A.G. Jarrett's excellent book. Even if these specimens could be linked to the leehmani form, I could not confirm. 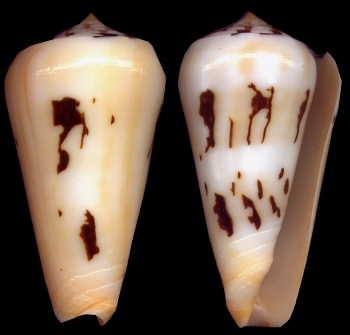 Recently I had the chance to browse The Conus Biodiversity Website and I found a picture of the actual holotype of Conus leehmani, da Motta & Röckel 1979. Eeffectively the specimens I found there can be easily linked to the leehmani form. As I have not found yet any classic specimen that could be closer to the ones illustrated in A.G. Jarrett books, I cannot confirm the presence of such shells. But as we can trust the author concerning the data of these 3 specimens, we can write that The Seychelles owns both Conus gubernator, Hwass 1792 and Conus gubernator form leehmani, da Motta & Röckel 1979. The specie lives deeply buried in the sand during the daytime. Shell is active at night. This shell lives usually from shallow water to 20m. It's a very uncommon specie there.